The Besty, a new food recommendation site, asked me to compile a list of the best burgers in LA, so naturally, I jumped at the chance to share my favorite meat and cheese masterpieces in my neighborhood — and beyond. PCB Burger @ Plan Check. Behold, the ketchup leather! 1. Plan Check: My favorite burger, hands down, in LA (and one of my Top 3 IN THE ENTIRE WORLD) is the PCB Burger at Plan Check. Chef Ernesto Uchimura has turned burger making into an art form from his perfectly prepared Wagyu beef patties to his invention of ketchup leather, a solid slice of ketchup (with a fruit roll-up like consistency) that imparts flavor and texture without making your bun soggy. Um, genius. And his housemade Americanized Dashi cheese shrouds your burger in a velvety blanket that is the perfect complement against one of his other brilliant inventions, the crunch bun, a soft yet crunchy puff of savory, fresh-baked dough. Trust me, this burger is rivaled by no one. 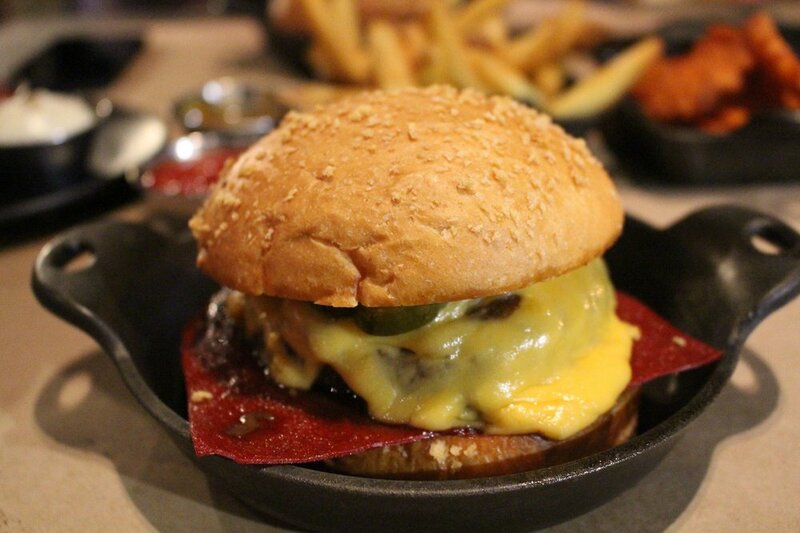 Extreme close up of the Republique cheeseburger. 2. Republique: Leave it to French fine dining master, Chef Walter Manzke, to elevate the cheeseburger while still keeping it simple and flavorful. 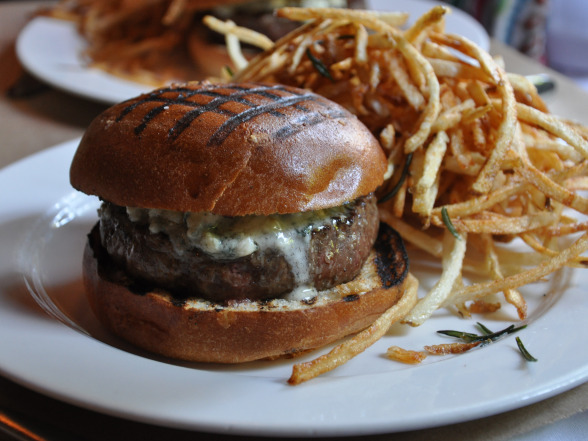 Republique’s one and only burger on the menu needs no modifications. I’m typically a medium rare girl when it comes to consuming beef but Chef Manzke prepares his at a perfect medium that gives it a crispy, caramelized outer sear while maintaining its inner juiciness. Then, he piles on plenty of American cheese (my favorite choice for the ooey gooey melty-ness you want in a burger), a wedge of iceberg lettuce, fresh tomatoes and a sweet, housemade thousand island dressing that plays beautifully with the tang of chopped dill pickles. 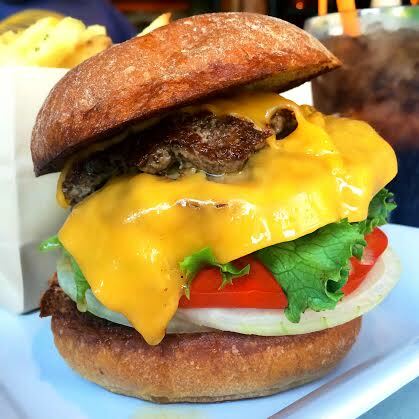 This burger is definitely WOW-worthy in every way, but the bun alone is something to be revered. Chef Manzke’s wife and house pastry chef, Margaret Manzke, whips up a fluffy, poppy-seed pain de mie that makes you feel like you’re transporting this burger to your mouth on buttery air. Magnifique. 3. 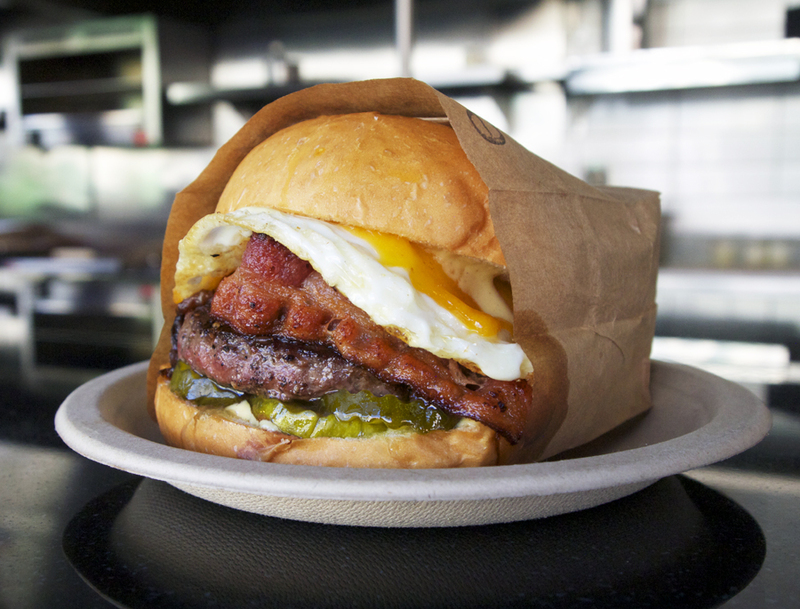 Eggslut: It should come as no surprise that the man behind THE BEST breakfast sandwiches in LA, Alvin Cailan, also prevails as a burger overlord with his Snake River Farms Wagyu Cheeseburger. A thick-cut ground beef patty soaks its weight in flavors as succulent caramelized onions mingle with the sharp kick of bread and butter pickles, creating the perfect platform for the robust, aged cheddar draped across it. Dijonnaise dips into the nooks and crannies of the meat, adding a savory zing that cuts right through to the runny, over easy egg perched atop it. It’s all about that yolk, though, as bright yellow silk drips lushly down a warm brioche bun, clinging oh-so-delicately to the burger like paint on a canvas. I like to refer to it as a ‘bread hug.’ (Don’t forget to add bacon!) This slutty blend of meat, cheese and egg, will keep you coming back for more (and more and PLEEEEASE MORE), but it won’t ever taste like sloppy seconds. Spotlight on the Karma Burger @ Haché LA. 4. Haché: A newcomer to the bustling Silverlake strip, Haché (pronounced ‘Hash-ay’) is an unassuming burger hut that boasts bold burger creations. Haché in French means ‘chopped’ and that is the centerpiece of what I call their meat de triomphe (keeping the French theme going here — indulge me, s‘il vous plaît). This triumphant patty of literally hand-chopped steak is a beacon of beef, bursting with a smoky, charcoal flavor that tastes like it hit your plate straight from a sizzling grill. Tender and juicy with every bite, the Karma Burger takes you on a distinctly All-American romp by way of France with creamy, yellow American cheese, vine ripe tomatoes, leafy green lettuce, fresh onion and zesty Karma sauce on a soft, airy bun. While each ingredient gives it that traditional burger feel, the real showcase is the ground steak, which is flaky and rich sans the grease. It’s probably why owner, Mick Schepers, purposely left the word ‘burger’ out of their name. But I can promise you that’s all that’s missing from this French-inspired meat mecca. Grass-fed goodness, blanketed in American cheese @ Burger Lounge. 5. Burger Lounge: Because you can’t always eat a rich, high-calorie burger, Burger Lounge offers the best ‘healthy’ burger alternatives around. Using only grass-fed meat and nitrate-free bacon, they manage to create a burger experience that makes you feel like you’re indulging without the guilt. Their Classic Burger is a nod to McDonald’s Quarter Pounder with an all-beef patty (that’s always perfectly cooked and juicy despite being organic, which usually tend to be dry because they’re less fatty), your choice of sharp White Cheddar or American cheese, mustard, ketchup and chopped onion (but I always substitute for a whole raw onion). The bun is a little more dense than the others on my list, but it works with the intense flavor of the meat and the thick crust of the patty gives it an old school burger joint feel. And you must try their monthly burger specials. 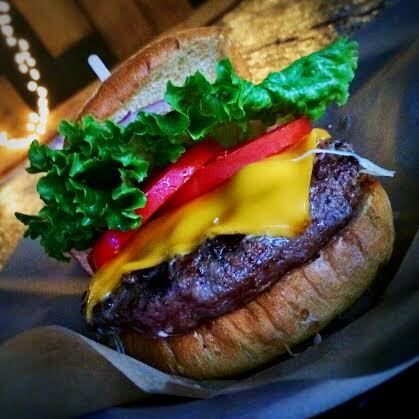 From Bison to Boar, no one grills up game meat as well as Burger Lounge. The one and only Black Label Burger @ Minetta Tavern. As an East Coast native and former New Yorker, my first love when it comes to burgers is at Minetta Tavern. Their Black Label Burger, which is only available in limited quantities, is not delicious because it’s exclusive or costs a whopping $26 bucks, it’s because it’s off the charts spectacular with every single ingredient carefully plotted out for maximum taste explosion. And I do mean, E X P L O S I O N. Your mouth will still be reverberating from its flavor long after the last bite. It also helps that it was conceived by the meat whisperer himself Pat LaFrieda, author of best-selling cookbook, MEAT: Everything You Need To Know. It begins with a dry-aged proprietary blend of beef, brisket and skirt steak, cooked in clarified butter (CLARIFIED. BUTTER.) and seasoned with salt and pepper throughout the grilling process. This cut of meat is coddled before it even hits the bun. 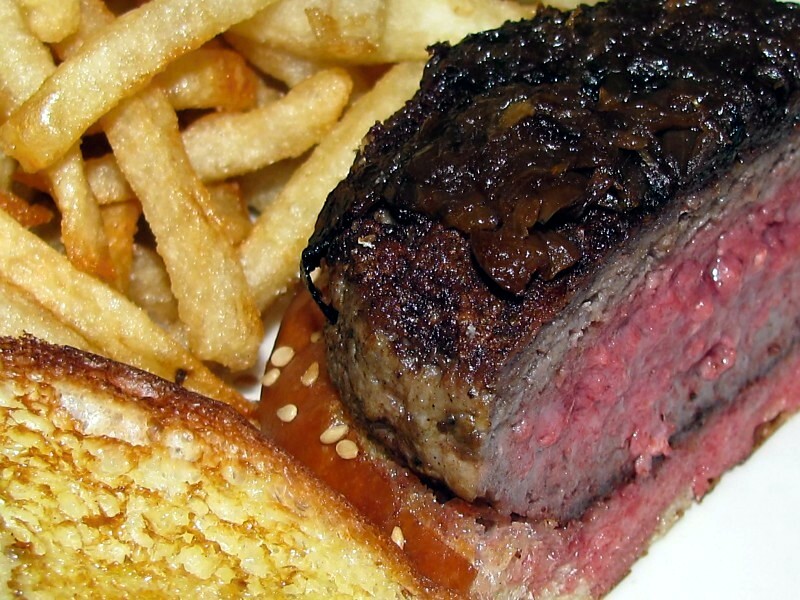 Onions are then sautéed up in the beef fat and caramelized, while a sesame seed bun (made specially to swaddle this burger by famed Balthazar Bakery) is popped in the broiler to achieve a golden brown toasted ring all the way around. You probably noticed that I didn’t mention cheese. That’s because there isn’t any. AND IT DOESN’T NEED IT. (I’m dead serious.) A meticulously prepared patty topped with salty-sweet onions, swimming in meat juices, are all you need. It’s like a steak dinner on a butter-soaked bun and it will make you feel like someone just gave you the best news. But I couldn’t include NYC without mentioning Shake Shack, the fast-food burger that doesn’t taste like fast food and won’t break the bank. There’s a reason why long lines are as much of a staple as their crinkle cut fries, and that’s because there’s no better greasy, cheesy burger around. 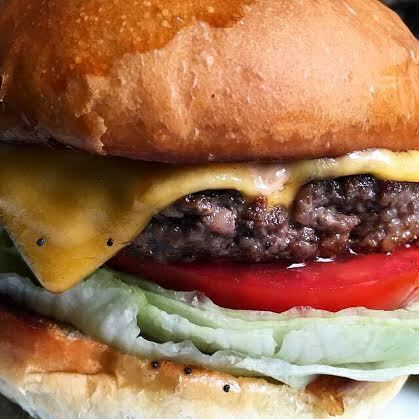 Pillow-soft potato rolls, hunks of house-ground 100% Angus beef, cascades of American cheese dripping along the sides, and the snap of fresh lettuce, tomato and onion are the pinnacle of an All-American burger and they’ve got it down to a science. And I can’t forget The Spotted Pig, my old haunt, and home of April Bloomfield’s now famous Roquefort Burger, covered in creamy Roquefort cheese atop a massive half-pound patty of ground sirloin, brisket and chuck (that resembles more of a flattened down meatball than a traditional burger patty) with its signature grill marks on the bun. Much like Minetta Tavern’s burger needs no cheese, this beauty needs no other accoutrements like lettuce or onion or even a special sauce. Just April’s holy trinity of meat, cheese and bun gets the job done. Lastly, if you every find yourself across the pond, Britain’s best burger is the Bleecker Black at Bleecker Burger, a gutsy cross-pollination of flavors you might not have thought to ever put together. Luckily, founder Zan Kaufman did. And it’s a combination I still dream about on the daily, over 5,000 miles away. 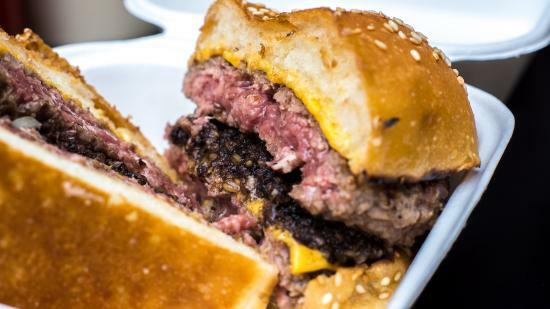 Two, medium-rare, dry-aged beef patties (and they always nail the ooze of pink, rare meat popping out of the center) encase crumbly, toasted black pudding. (Yes, black pudding. No, you shouldn’t be afraid.) 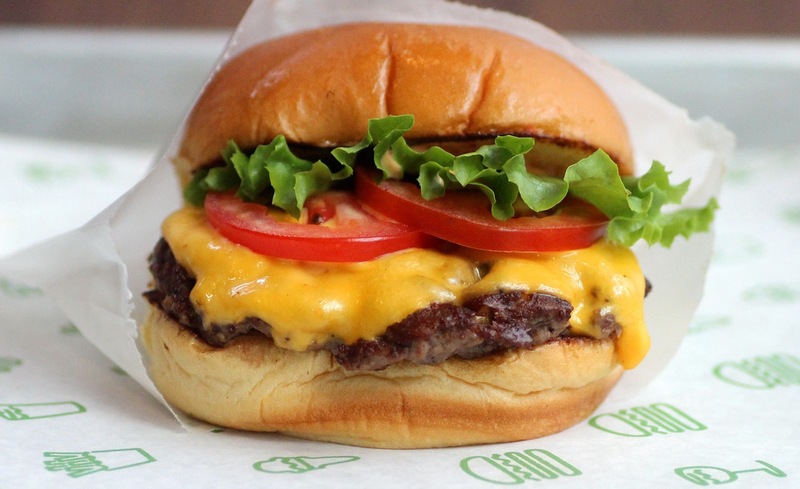 Then, they top it with lush American cheese and crisp white onions, creating a majestic blend of savory acidity against the sweetness of a lightly charred sesame seed bun. The flavors alone are out of this world, but the textures awaken all of the senses as succulent beef dances over crumbles of black pudding and languishes across sticky strands of American cheese until the final crunch of the bun and onion complete the journey into a full-on, no-holds-barred, toes-curled meaty climax. Oh. My. Goddddd. « Chestnuts Simmering On An Open Stove Top. Jack Frost Nipping At Your Nose.